I like rainy days, walking on the beach at the beginning of a storm, and Farscape. Oh, and pretty, shiny objects. And sometimes I just feel like shooting little, crying, purple guys between the eyes to put them out of their... and more importantly...my misery. "This goes beyond anything I've ever done. It's a total loss of control. Not in the nice wholesome "my girlfriend has a pierced tongue" kind of way." I don't think like others, usually coming to conclusions from a sideways angle. So if I've confused you about something... speak up and let me know so I can attempt to clear things up for you. Feel free to friend me if you like, I certainly don't mind. That doesn't necessarily mean I'll friend you back though. It depends on if you write fanfic or vid or just have the same interests and ideas as I do. Just don't take it personally if I don't friend back. This is a Ship-Friendly Zone and I asks that there be no bashing of anyone's OTP. If you do I will smack you upside the head with a lead-lined trout and kindly ask you to respect others choices. If you don't then I will ask you to leave my journal. Having said that....my ships are: John/Scorpius, John/Stark, Cam/Teal'c, Cam/Daniel, John/Aeryn, D'Argo/Chiana, Cam/Sheppard, (and if it's done well) Jack/Sam, Sheppard/McKay, and Sam/Cam. I like to make icons, wallpapers and recolor photos to suit my fancy. I like to share the things I create, but if you repost or use anywhere: Please credit me. I'm a Ben Browder fan and I tend to get a bit excited about his roles. But don't worry it's not at the sacrifice of his castmates. Kaz' internal v-chip is busted! kazbaby is a very talented video editor! Kaz understands the importance of Ben Browder to a happy, well-adjusted life. 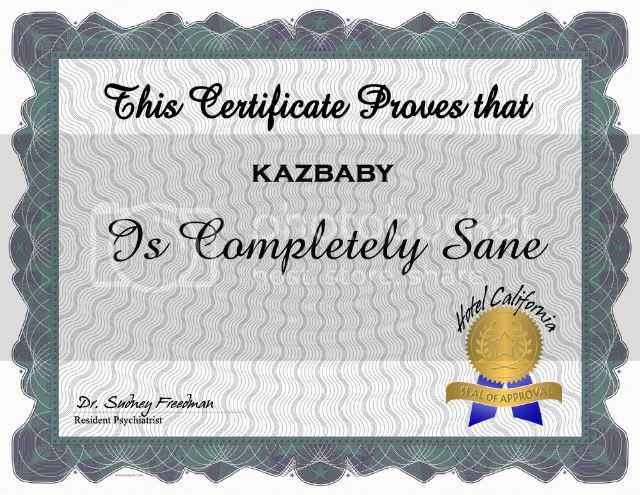 kazbaby spreads Farscape love with awesome links, vids, chat, and fics: a great starting place for the new 'scaper. lee_in_limbo: A fabulously talented writer and a woman of strong character and convictions, who is nevertheless a fun and lovable human being. I would gladly give this woman a big hug if I could make my way to one of those famous Farscape conventions I keep missing. grammarwoman: When it comes to fandom, Kaz is the Statue of Liberty, welcoming the huddled masses yearning to breathe free and lifting her lamp beside the golden door. Plus, the Ben Browder picspams are frelling HOT. You are like the lemon merangue tart of evol!